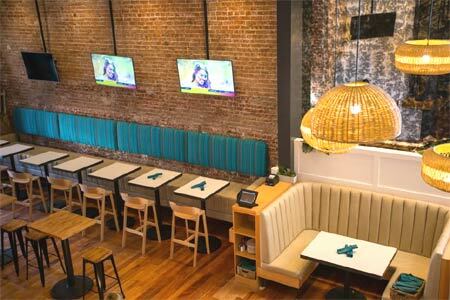 Cocina Cilantro offers healthy Mexican fare in Glendale, with a menu of organic, non-GMO dishes that incorporate grass-fed beef and free-range chicken. The gluten-free tacos range from carne asada and lengua to shrimp and soy; also look for loaded Mexi-Cali fries, ceviche, a beet tostada, cilantro-lime rice and kale quinoa salad. Cocina Cilantro, 247 N. Brand Blvd., Glendale, CA 91203, 818-484-7248. El Zarape adds a new Mexican option to the east end of Melrose. Look for breakfasts with omelets and chilaquiles, and later on ceviches, enchiladas, tacos and combination plates. To drink there’s Mexican beer, micheladas and sangría. El Zarape, 4809 Melrose Ave., Los Angeles, CA 90029, 323-848-4609. Mole impresario Rocio Camacho (Don Chente, La Casita Mexicana) has opened her own restaurant called Tacos & Mezcal in Bell in the former Corazon y Miel space. Her specialty here is Oaxacan cuisine, ranging from appetizers like bacon-wrapped jalapeños and octopus salad to specialty tacos de cazuela (casserole, or stew) filled with braised pork, rajas, skirt steak or the more exotic nopales and grasshopper. Tacos & Mezcal, 6626 Atlantic Ave., Bell, CA 90201, 323-537-2789. Testa is now open downtown with a contemporary Cal-Italian menu and cocktails from Devon Espinosa. Chef Marty Shield (Woodley Proper) dishes up grilled prawns with bagna cauda, beet risotto, roasted chicken with smoked rainbow carrots and mascarpone semifreddo. Look for a select offering of Italian, French and California wines. Dinner Tues.-Sun. Testa, 1111 S. Hope St., Los Angeles, CA 90015, 213-973-5013. In DTLA’s Arts District, the restaurant group behind Zuma will open a sprawling 8,000 square foot robata eatery called Inko Nito. Look for cocktails, too. Expect a winter debut. Inko Nito, 225-227 S. Garey St., Los Angeles, CA 90012, no phone. Burbank’s Guildhall is an eSports/board game lounge, offering 150 old-fashioned board and tabletop games and streaming eSports events on several TV screens. The bar menu features a Juicy Lucy burger, grilled chicken sandwich, mixed green salad, hummus and pita, and Buffalo chicken strips. Lunch & Dinner daily. Guildhall, 3516 W. Victory Blvd., Burbank, CA 91505, 818-561-4552. Vegan eatery Bodhi Bowl has opened in DTLA. Specialties include plant-based bowls featuring the likes of quinoa, lentils and kale with lemon mint dressing; soba noodles with sweet chili tofu; and brown rice with curried garbanzos. Also find a variety of panini, wraps, soups and smoothies. Breakfast, Lunch & Dinner daily. Bodhi Bowl, 645 W. 9th St., Los Angeles, CA 90015, 213-622-6560. In Beverly Hills, Chaumont Street offers a healthy, fast-casual café menu including bowls made with lemongrass chicken, wild salmon or grass-fed beef on top of organic jade rice, veggies and herbs. For dessert, try a “frossant” of organic ice cream in a croissant cone. Chaumont Street, 145 S. Beverly Dr., Beverly Hills, CA 90212, 424-335-0622. In October, the Paseo Colorado mall in Pasadena will welcome Great Maple, a new “modern American eatery.” Look for a bright, mod, luxe diner setting; expect menu items to range from seasonal berry and kale salad to truffled deviled eggs, a prime rib dip, salted caramel pork ribs and buttermilk fried chicken. Great Maple, Paseo Colorado, 300 E. Colorado St., Pasadena, CA 91101, no phone. Husband-and-wife team Quinn and Karen Hatfield (Odys & Penelope, The Sycamore Kitchen) have ventured downtown with The Mighty, a casual restaurant serving up organic salads, sandwiches, house-made pastas, rotisserie chicken and more. The Mighty, 108 W. Second St. #105, Los Angeles, CA 90012, 213-278-0025. Chef Dave Beran, former executive chef at Grant Achatz's Next restaurant in Chicago, is striking out on his own on the West Coast. 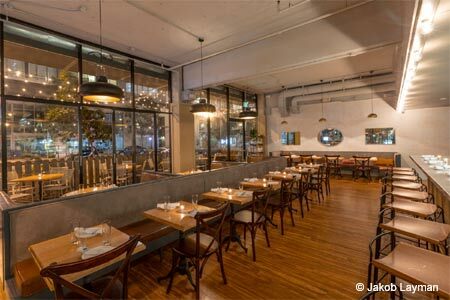 His restaurant, Dialogue, offers an intimate tasting menu experience at The Gallery, the newly renovated food hall on Santa Monica's Third Street Promenade. Dialogue, 1315 Third Street Promenade, Santa Monica, CA 90401, no phone. Surfside Venice Bar + Grill has opened just off the Venice Beach Boardwalk. Patrons savor nachos, burgers, fish tacos, salads, brown rice bowls and brunch fare, along with local craft beers and cocktails. 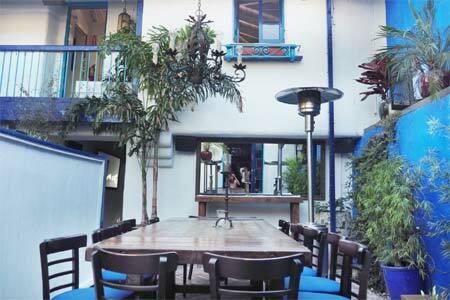 Surfside Venice Bar + Grill, 23 Windard Ave., Venice, CA 90291, 424-256-7894. Daniel Patterson (Coi, Plum, Locol) plans to open an LA outpost of his popular SF neighborhood restaurant Alta in West Adams next year. 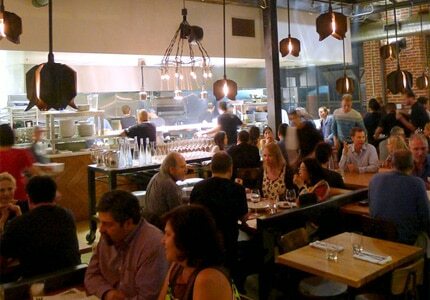 Look for casual California cuisine starring local SoCal ingredients, and a sprawling, 2,500-square-foot dining space. Alta, 5365 West Adams Blvd., Los Angeles, CA 90016, no phone. Former Noma and Californios chef Joseph Geiskopf, also lately of Destroyer, is opening his restaurant Triniti in Echo Park this fall. 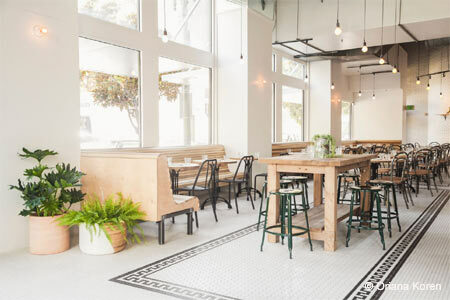 Look for inventive small plates, high-end coffee drinks via Tartine roastery, compelling craft cocktails and plenty of Eastside hipster ambience. Triniti, 1814 W. Sunset Blvd., Los Angeles, CA 90026, no phone. 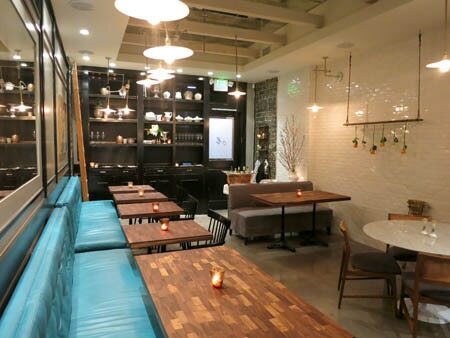 New seafood spot Fishwives makes a splash in Pasadena, with a New England-style menu featuring a dozen varieties of fresh Atlantic and Pacific oysters, little neck clams, Peruvian scallops, PEI black mussels, jumbo shrimp and uni. Mains include fish and chips, steamers, clam chowder, Maryland crab cakes and a lobster roll. Look for draft and bottled beers, boutique wines and saké. Fishwives, 88 N. Fair Oaks Ave., Pasadena, CA 91103, 626-219-6199. Restaurateur Jesse Gomez (Mercado, Yxta Cocina Mexicana) has transformed his former Maradentro in Studio City into the more casual Mercado Taqueria, a “contemporary bar serving tacos and tablitas on handmade tortillas.” Beyond elevated tacos, look for a ceviche verde tostada, calabacitas toast, carnitas, carne asada and whole grilled fish. Cocktails from Cesar Arenas include sophisticated tequila and mezcal concoctions, and there’s a Mexican beer selection, too. Dinner nightly. Mercado Taqueria, 11929 Ventura Blvd., Studio City, CA 91604, 818-358-3423. Sapor has opened in Koreatown, offering Asian-inspired modern tapas from chef Matthew Ignacio and craft cocktails from barman Vincenzo Marianella (Copa d’Oro). Look for dishes like roasted lamb riblets with mint romesco; galbi with bone marrow and scallion purée; bulgogi croquettes; and scallops with corn, butterscotch and grits. Sapor, 3600 Wilshire Blvd., Los Angeles, CA 90010, 213-232-4663. 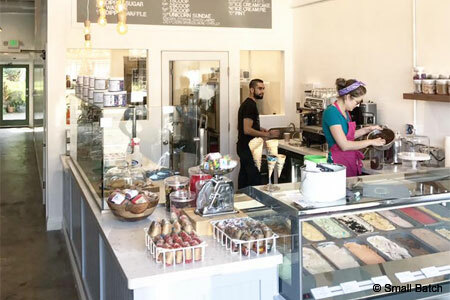 “Top Chef” champ Brooke Williamson and Nick Roberts (Hudson House) have debuted their second Small Batch artisanal ice cream shop in Los Angeles, located in Mar Vista. Look for unique flavors like Banana Cream Pie, Lemon Sorbet with Strawberry Pop Rocks, and Fresh Sweet Corn, plus other frozen novelties such as White Chocolate Thai Tea Popsicles and Mint Oreo Ice Cream Pie. Custom sundaes, milkshakes, ice cream sandwiches and slices of birthday cake are also available. Small Batch, 12222 Venice Blvd., Los Angeles, CA 90066, 424-289-9552. The newest location of Mainland Poke Shop has opened in Beverly Hills along South Beverly Drive. Look for fresh, sushi-grade fish including toro, salmon belly, blue crab and octopus in customizable bowls or signature bowls. Healthful base options range from kelp noodles to baby greens and kale. Lunch & Dinner daily. Mainland Poke Shop, 130 S. Beverly Dr., Beverly Hills, CA 90212, 424-335-0372. Brothers Daniel and Chris Skaf have debuted The Yardbird in Glendale. The restaurant specializes in fire grilled Cornish hens and California fresh salads and sides like fried Brussels sprouts with red onion, spicy corn with smoky compound butter, red cabbage slaw, and kale tabbouleh. The Yardbird, 1147 E. Colorado St., Glendale, CA 91205, 818-484-7654. After the year 2017 comes to a close, chef Curtis Stone's Maude restaurant will change its monthly tasting menu format. Consider visiting for one of the final themes: "Greatest Hits" in October ($195), "White Truffle" in November ($350) and "Black Truffle" for December. Reservations are required. In 2018, the Beverly Hills restaurant will present quarterly-changing tasting menus inspired by wine regions. Maude, 212 S. Beverly Dr., Beverly Hills, CA 90212, 310-859-3418. Bestia in the downtown L.A. Arts District was briefly closed due to a kitchen fire, but the Italian hotspot is re-opened for dinner service on Tuesday, September 5, 2017. Bestia, 2121 E. 7th Pl., Los Angeles, CA 90021, 213-514-5724. In Santa Monica, Marc-Antoine Rambaud’s restaurant L’Ami has closed. L'Ami, 246 26th St., Santa Monica, CA 90402, no phone.